Many newly engaged couples have lost more than the occasional night’s sleep while fantasizing about their pending wedding. Romantic heartfelt words flow freely from the sweet lips of husband or wife to be as they exchange the vows of their misty dreams. However, when the time comes to actually pen, or worse; to speak such prose out loud, the words suddenly stall. Gone are the simplistic, archaic, and somewhat subservient somber pronouncements “To love, honor, and obey, till death do you part” of our Grandparent’s day. Such intoning leaves a couple, and their guests, void of the magic which brought them to the proverbial “altar” to begin with. The words spoken at a wedding ceremony should reflect not only the love shared between the couple, but the deep, profound respect and honor they feel for one another at that very moment. The Officiants at Hudson Valley Ceremonies work very hard to capture the right words that mirror this unique love. Upon meeting a couple for the first time we immediately begin getting to know one another. Where you have come from very often sets the stage for whom you have become, so sharing some stories about your background is usually the best beginning. How and why your lives evolved to synchronize your meeting each other, then revealing the ways your friendship blossomed into love, and furthered onto a serious life-long commitment is vital to writing and delivering a ceremony that will leave all present talking about it for years to come. 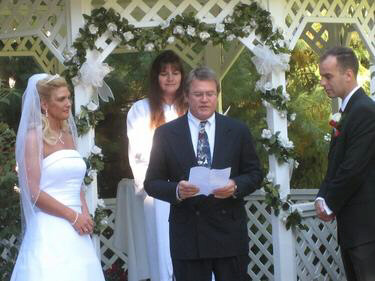 We provide you with dozens of sample ceremonies, and I develop a personalized, blended ceremony using several options, just as an example of how harmonizing together a Remembrance, Recognition, Wine or Unity Candle service can bring excitement and enlightenment to your ceremony. In the end though, remember the words are yours to edit and ad lib, creating the reality of those musings you only once imagined. For me, my goal is to bring to life all those rehearsals you played over and over in your mind. After an initial letter of introduction and communication via email, we then meet in person. 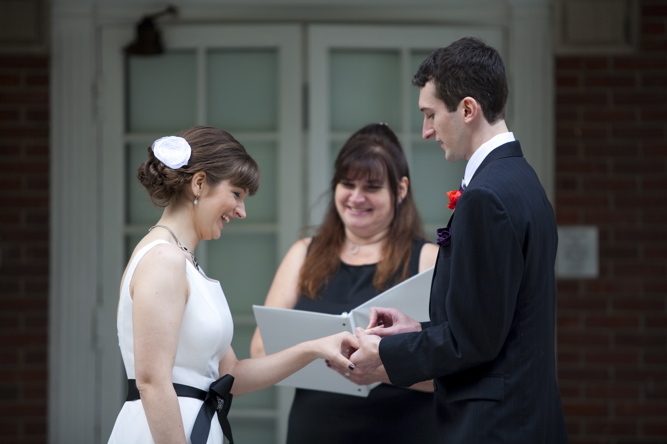 Depending on the type of Officiant Package a couple chooses, we may meet at their home, a local diner, or here in Rhinebeck at the Hudson Valley Ceremony Office. Meeting in Rhinebeck is a complimentary, no obligation option which allows the couple to also look through Invitations, Save-the-Date, RSVP, and Thank You cards by the hundreds, which we offer clients at our wholesale price. This is a savings of 50% off retail prices. Top that off with tremendous discounts on; Bridal Party Gifts, Favors, Table Settings, Cake Toppers, Themed Napkins, Center Pieces, Honeymoon Travel, and low cost Wedding Insurance along with our discounted Vendor referrals and you need not spend one stressful moment searching for these necessities. You can complete your wedding shopping in that one visit! After our first meeting, we encourage our couples to continue communication by phone or email, establishing an extended family relationship with us. My motto is “My words to you at the altar, even if scripted, are from my heart.” It is important to me that you as a couple genuinely feel that from me. Your day becomes a special moment in my own life, cherished and remembered; a true privilege and honor to me to be permitted this glimpse into your wonderful life. Over time we email the ceremony back and forth, editing and adding as your day gets closer, until you both feel that it reflects everything about you and everything you wish said, and to say. The most common question I receive about the Vows section is from the Groom who is most worried that those long promises must be memorized. If I am present at a rehearsal it brings a huge laugh when I tell the Groom the night before the big day “Yes! We expected you to have memorized this by now!” But in truth, the traditional “Please repeat after me” still holds true even in our modern day. Although we will not actually recite nor reveal the special words of your ceremony at a rehearsal we will coordinate and practice the Processional and Recessional, and go through the sections of the ceremony which cue the Musicians or Ushers as to when and where their participation would be required. Your rehearsal will last as long as need be, until everyone is most comfortable with their varied roles. We encourage older family members to attend, but for those who are unable they are easily substituted for the moment with a younger family member, which also keeps the evening light and fun. This is all about uniting not only two persons, but two families, and communities. It is my belief that such local unity is the key to our global alliances, and what better way to begin that long journey than hand in hand with a partner who shared your dreams and shares your path.